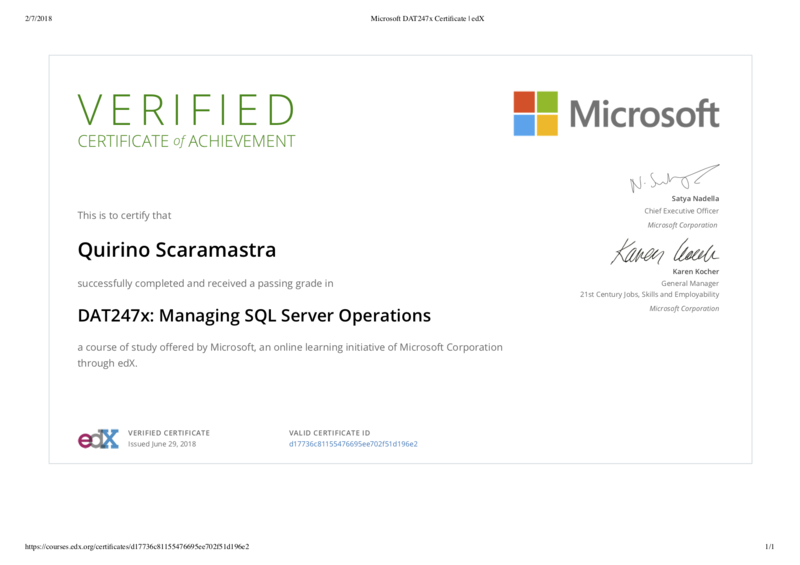 Hello, I’m a Senior Microsoft SQL Server Database Administrator & Consultant from Roma, Italia. My IT career started as a hobby when i was a boy , with the BBS (Bullettin Board System) 25 years ago. "The Black Hole BBS" Now i am a seasoned DBA with more than 18 years of hands on experience operating complex and business critical systems for a wide variety of customers. Financial , Industry, Government ,Comunications Company. 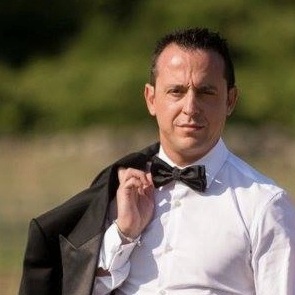 Quirino Scaramastra offer proactive IT strategy, systems design and ongoing support to streamline your business operations with SQL Server and Data, increase productivity and boost profitability. Specialties: Proactive database maintenance, capacity planning, performance tuning and optimization, high availability solutions, backup strategies and disaster recovery planning. I worked and work with all versions of SQL 6.5/2000/2005/2008/2012/2016/2017. I am a seasoned DBA with more than 18 years of hands on experience operating complex and business critical systems for a wide variety of customers. Financial , Industry, Government ,Comunications Company . You see my last experience below . Microsoft SQL Server Database Administrator at INAIL DCOD . I am responsible to manage multiple servers for the insurance part our servers have 160,000 daily visitors and tens of millions of users. Every day I check the infrastructure and servers. I give support for development group , about performance, security and applications policy for compliance. Microsoft SQL Server Database Administrator at INAIL DCOD . I am responsible to manage multiple servers for the insurance part our servers have 160,000 daily visitors and tens of millions of users. Every day I check the infrastructure and servers. I give support for development group , about performance, security and applications policy for compliance. We’ll let you in on a secret. Innovation isn’t confined inside the walls of research labs swarming with PhDs. More often than not, innovation is about ordinary people solving problems that matter to them personally. This could be you.First, think about what you need. Next, find out whether others want the same thing. If they do, you can start a venture – for profit or non-profit - to supply others with the novel product or service you first developed for yourself.The examples of user innovation are infinite. A surfer created the GoPro to take “selfies” while surfing. A student came up with Dropbox after forgetting his flash drive. Two broke entrepreneurs rented out their living room to help pay rent, and Airbnb was born. They’ll share their paths to startup success.Taught by Eric von Hippel, the founding scholar of user innovation, this course will help you think about what problems you should choose to solve and how to share your innovations with others. This Digital Programs course will survey state-of-the-art topics in Big Data, looking at data collection (smartphones, sensors, the Web), data storage and processing (scalable relational databases, Hadoop, Spark, etc. ), extracting structured data from unstructured data, systems issues (exploiting multicore, security), analytics (machine learning, data compression, efficient algorithms), visualization, and a range of applications. SQL Server Managing and Administration. A man with great level of confidence and high level of technical ability, Quirino has always been a motivator to strike for excellence. A hard worker and truly focused towards his job, Quirino has always been an inspiration.. I think that Quirino is a dedicated and considerate colleague. He is always willing to help and try his best to deliver with quality. He has a broad skillset and a nac for digging in to problems and stick to them until they are solved. Quirino ability is not limited to the technical layer but also extend to driving tasks, development and coordinating people to get things done.